Certification Marketing Awareness Month? Really? Yes! 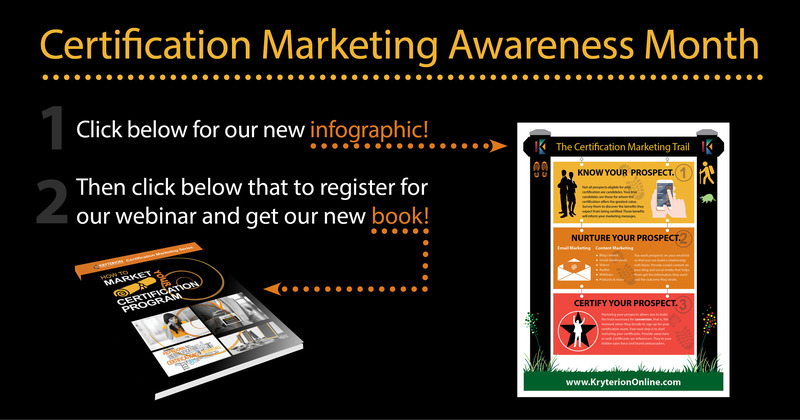 Certification Marketing is a very popular subject here at Kryterion, Inc.. The truth is, we’ve been focusing on it for years, so we just decided to make things official by proclaiming the next 30 days to be Certification Marketing Awareness Month—at least in our office. We’d love for you to catch the spirit, too, so now’s the perfect time to download our brand new infographic: The Certification Marketing Trail. Click here! And while you're at it go ahead and register for our info-packed, 30-minute webinar, too! We'll be doing an encore performance of our world-famous Certification Marketing Webinar on Wednesday, May 2. Choose the time that works best for you, either 9 a.m. PST or 1 p.m. PST. Click here to register! So, you’ve downloaded the infographic and registered for the webinar. Could this day possibly get any better? When you attend the webinar—again, it’s just 30 minutes long—you’ll get a free copy of our brand new book, How To Market Your Certification Program. It includes even more great marketing strategies than those covered in the webinar, so it’s a must-have for driving more prospects to your certification program. We’ll deliver the book for free right to your door. All you have to do is unwrap it and read it!